Remember all that funfetti cake I was making a few days ago? Well, this is what it was for! This cute little owl cake is for a baby shower of one of my coworkers. 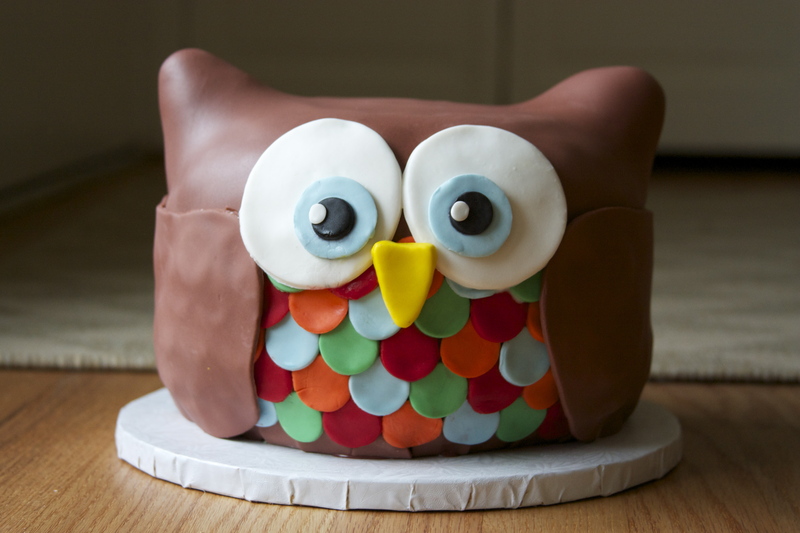 The theme of the shower is owls, so duh, why wouldn’t you have an owl cake? This cake was very fun to make. In addition to it being adorable (love the colors! ), it also wasn’t super duper complicated. In fact, I started the cake around 7:30 and was done by 10:30. Finishing a cake before midnight is basically a miracle for me so I’m not sure how I ended up so far ahead of schedule. I also managed to take pictures of the process, so here’s a little tutorial on how I made this little fella (I have named him Charles). Charles started out as four nine-inch diameter funfetti cakes with chocolate icing between the layers. I then free-hand carved the stack of cakes into a round-ish shape. I gave him a nice crumb-coating of icing to keep it all together and give something for the fondant to stick to. His ears are made of triangular blobs of fondant stuck on with toothpicks. For the base of the cake, I covered it with a layer of brown fondant. Since I knew I was going to be putting feather details on the cake, I didn’t worry too much about making sure the fondant reached all the way to the bottom. Also, I was low on brown fondant and was too lazy to make more. I cut out some small circles out of blue, orange, green, and red fondant and glued them to the cake with a little dab of water. As you can see, I covered up the area where the fondant didn’t reach to the bottom and you can’t even tell. The wings are just rolled fondant cut to the right shape and stuck on with some water-glue. After adding they eyes and the beak, it’s time for a little airbrush action. As you can see, when I’m rolling the fondant out, there usually ends up being some amount of corn starch residue (on the feathers). Using vodka in the airbrush, I give the cake a good shower to get rid of any white corn starch. As you can see, the cake ends up pretty shiny after a bath in vodka. I used vodka instead of water because it dries much faster. I also applied some feather detail to the bake of the cake. And this is the finished product after it’s been airbrushed. It dried overnight as the vodka evaporated and ended up with a much more matte look. And that’s it! Looking at this picture right now, I’m realizing I forgot to give Charles feet! Let’s just say they’re tucked up underneath him keeping warm.